This machine are widely used for Pillows, Cushions, Beddings Covers, Down Jackets cotton fiber filling. FOXSEW Semi-Automatic and Movable Down and Feather Filling Machine are special for filling of feather duvets, down jacket, feather pillow down products. The device uses advanced technology from Germany, easy to use, easy to operate, velvet flowers do not run does not leak, and less wear and tear. The motors are special motors, brake Sensitive, small power consumption down manufacturing industry today. Easy Use and Operations: Jut put the down or cotton fibers into the yellow hopper, until the monitor shows the weight you need, then switch the pedal with your foot until all the down or cotton fibers in the hopper is feeded into the garments peices. FOXSEW Sewing Machine is a professional Manufacturer and Supplier of High-Quality Automatic Sewing Machines, Sewing Machine Unit and Workstation, Programmable Pattern Sewing Machines, Heavy Duty Sewing Machines, Leather Upholstery Sewing Machines, Tape Cutting Machines, Industrial Sewing Machines, Special Sewing Machines, Cloth Cutting Machines and Household Sewing Machines. FOXSEW focus on High-end Sewing Machines Market in the world, they had been always supplying the best quality machines for respected customers from all over the world. FOXSEW Machines are widely used for many field, such as Garments factories, Leather Sofa and Furniture Upholstery industries, Automotive Interiors, Bags and Handbags, All kinds of Case and Suitcase, Webbings and Slings, Tents and Parachute, etc... Nowadays, you can find everywhere the sewing machines existed, and FOXSEW are there together with you. 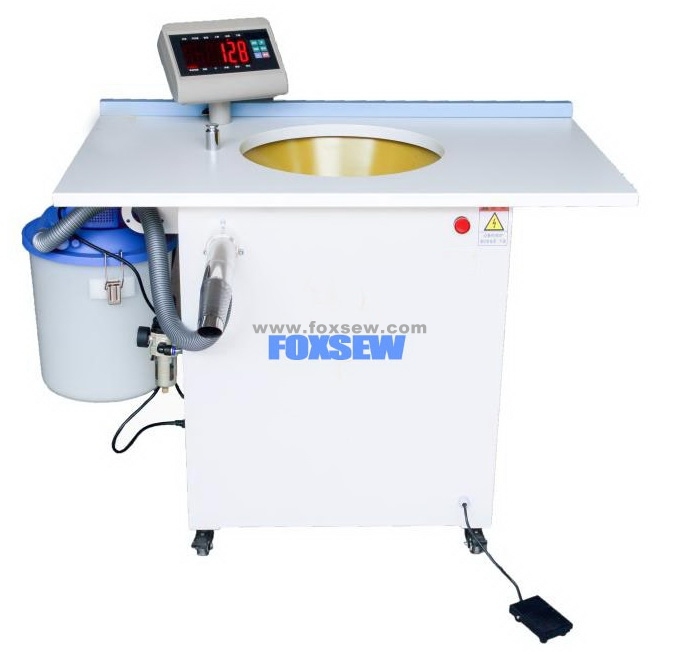 FOXSEW is also doing well in the Garment equipments, our Cutting machines are also popular with customers from different countries, Automatic Sharpening Straight Knife Cutting machines, Round Cutting machines, Hot cloth Drill, for Tape cutting machines, FOXSEW is the number one manufacturer and supplier in China mainland, you can find all kinds of Tape Cutting machines here easily. Household Sewing Machines sold very well both in North American market & European market. All the products are in good quality and outstanding performance, they are selling well all over the world Like South America, South Asia, Middle east, Southeast Asia, Africa, East Europe, Middle & North America, South East Asia, etc... The perfect after-sales service won praise from all the customers. We believe in "High Quality is the Soul of an Enterprise", what we want is just to do the best service to our customers, Now, let`s see Where Sewing Happens ! Company Name: TAIZHOU FOXSEW SEWING MACHINE CO.,LTD. Copyright © 2019 www.czspraydryer.com All rights reserved.